Design for Us is a project and toolkit by designer, Mike Fretto, completed during his Masters Programme at the University of Washington. 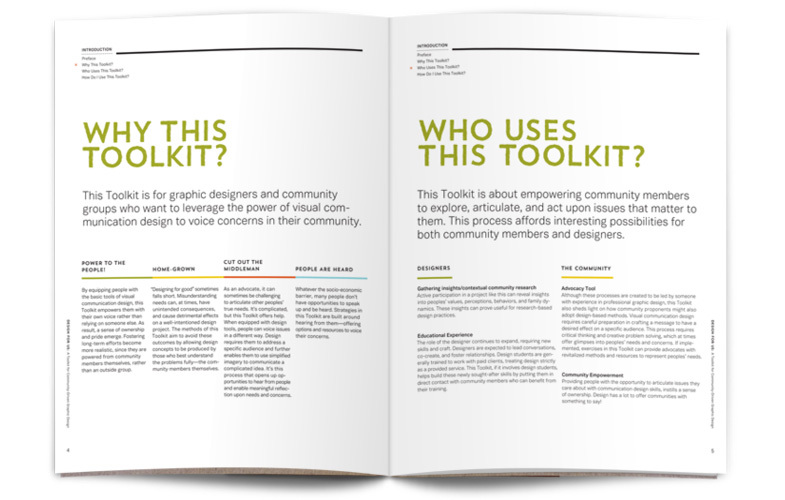 The toolkit is based on a workshop Fretto conducted with young people in Yesler Terrace, a public housing development in Seattle, U.S. A champion of considered, inter-personal interaction, Fretto’s states, ‘This Toolkit is for graphic designers and community groups who want to leverage the power of visual communication design to voice concerns in their community.’ The workshop was participatory—meaning it engaged the community to choose its own issues and create communication for itself. “Helping people in need was always my intention, but in the end, I questioned whether my interventions were truly helping or just making a complicated situation more complicated. Participation in design appealed to me because it included something that was missing before—the voices of those whom my design intentions would ultimately impact. But he also openly acknowledges the workshop ‘… wasn’t squeaky clean’, stating ‘… This Toolkit is far from perfect; it certainly doesn’t provide all of the answers…’ But the Toolkit is really quite thought provoking, in part because the honest tone throughout the text invites you to ask questions about this project and participatory design work in general. As a student project we can look at this in context of an exploration of ideas. recruitment. Putting it into Action takes the reader through the execution of a project, with topics like launching the project, building skills and dealing with setbacks. Fretto delivers this with straightforward practical advice, interspersed with anecdotes from his experiences during the workshop. On the first day of my workshop I had a great discussion with high school-aged participants around the question, “what makes design good or poor?” There were colorful responses and many different perspectives discussed but one student in particular made a great point. He implied that design is poor when it doesn’t deliver what is promised, as in a vacuum cleaner that boasts of durability but then breaks days after you buy it… I wanted to prod deeper, bringing the issue to the surface. But in doing so, I was asking leading questions. I forced the discussion in one direction in efforts to illuminate the point that was almost made earlier. One of the oldest participants was on to me. He asked, out of frustration, “Do you just want us to say that design can be dishonest? Because it just feels like all you’re trying to do is get us to say that!” Bold! I moved on confident, but was embarrassed. I realized that while trying to remain neutral, I simply pushed too hard for the point. Looking back on it now, I probably should have spoken up and made the point myself. Something won’t go as planned; accept this fact! The workshop will likely encounter some bumps in the road no matter what—and working with human beings sometimes gets messy. Some of these bumps are unavoidable, but others can sidestepped— especially this early in the planning stage. TIPS: HELP! My Participants Are Not Talking! Consider trying “Think/Pair/Share,” a technique that makes it easier for participants to speak up in a group setting. 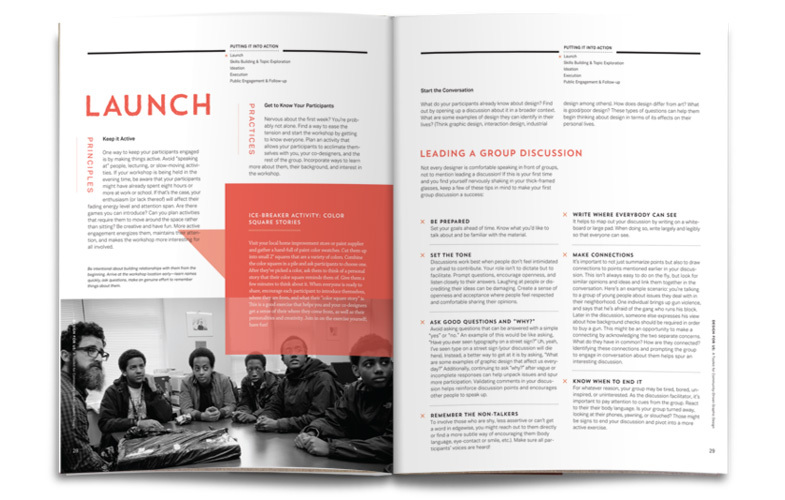 First, bring up an idea that you’d like the group to think about individually. Then ask them to pair up with a partner and share their responses with each other. Finally, one of them will present their collective responses to the group. This method yields productive discussions, especially if you have shy participants. I have worked for organisations in the past which use participatory methods, specifically within photography. Reading through Design for Us got me thinking back to this work and some of the issues that came up then which are as relevant to graphic design as they are for photography. 1. Why these people? Why these issues? Why us? What is our own motivation for working with a group of people or for a certain cause? Am I really the right person for the job? Asking this question can help us understand what we can actually do, the impact we can realistically have and where our unique skills are best placed and matched. It can also lead us to understand who we need to work with in order to really have the impact we want. Put simply, being honest about our own motivations can help us understand our potential to effect change. For the participants Fretto advocates a Circle of Influence exercise, whereby the participants plot issues they’re interested in based on a scale of being close to them or affecting them personally, to issues affecting the whole world. This helps them find an issue that is meaningful to them and which they can affect. The same process can be applied by the designer/facilitator themselves. 2. How sustainable is the project in the long term? If it’s difficult to fund a project, what does that tell you about the possibility for the project to be taken forward after your involvement? If it’s a project for the community, how feasible is it to be self sustaining, without your involvement after a certain stage? If it’s a single project that happens just this once, what is the desired impact in the short term and will people be left with faith in the next practitioner who comes along to effect change in their community? If you discover your goals differ from your partners it’s time to re-evaluate why you are doing the project and who you’re hoping to serve. 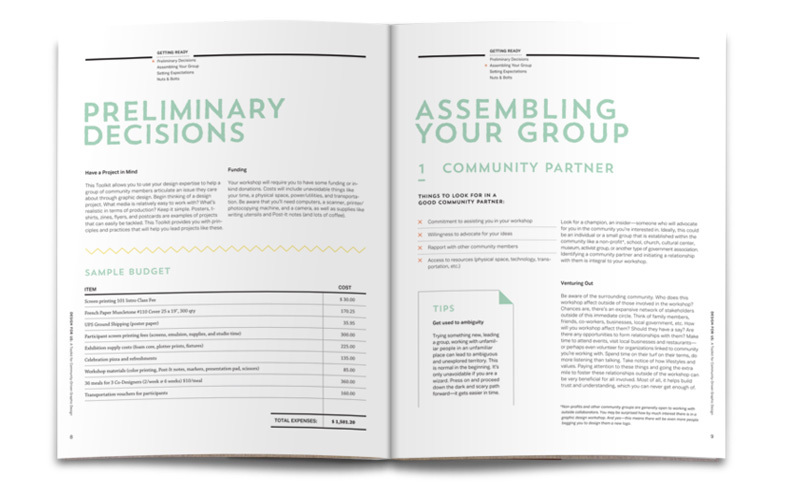 When you get partners involved in a project they have to be real partners—equal and respected. 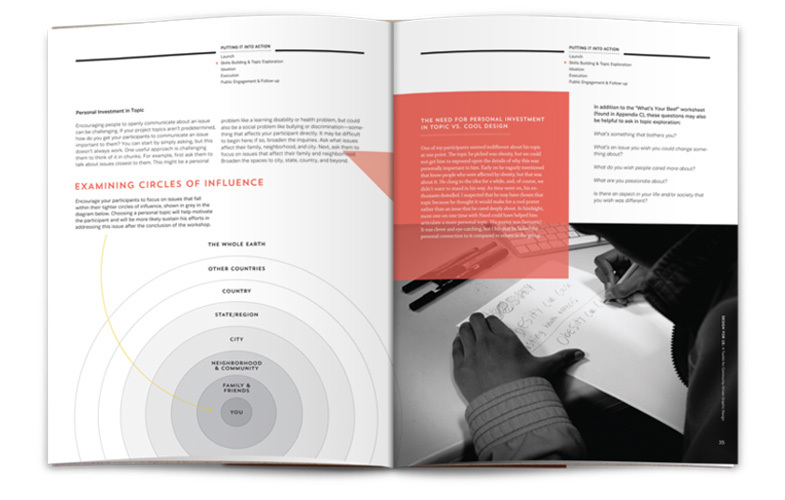 They might not work with design but in designing for social impact, ‘design’ is but one part of the process. 4. What are your expectations of the project and what are the participants expectations? Who created those expectations? This is about looking inwards. Understanding what the potential really is, and what the limitations are. We need to be realistic about what a design project can achieve. It could be a lot, it could be very subtle. Claiming too much of the potential of a project at the start raises expectations and makes achieving anything meaningful very difficult. This is also where, as designers, we can honestly contribute by articulating just how much impact design can have—and the conditions that need to be there make that change. Visual communication for change doesn’t happen in a silo and the mechanisms needed to support it should also be communicated. 5. Along with the means to express themselves have we helped participants understand how their work might be interpreted by their audience? Understanding our audiences and how people ‘read’ images and text, is as much part of our skills as designers as having the technical ability to make something aesthetically or conceptually powerful. This understanding also needs to be passed on so that participants are aware how their work could be perceived. Sometimes it is hard to ask these questions during a project because ultimately the answers might reveal uncomfortable truths, or highlight flaws in our work. Perhaps it might reveal that the project is too short or promises more than it can deliver. It’s for exactly these reasons we have to ask the questions. Fretto’s efforts offer a great starting point. Such documentation and reflection push us all to think more deeply about our own work and methods and, going forward, help us develop more meaningful and considered projects.